This is quite a difficult period for BlackBerry. After losing huge chunks of their market share in the past few years and being branded as outdated, Research in Motion is looking to make another impact on the global market with BlackBerry 10. Announced a year ago, BlackBerry 10 was supposed to completely change the ailing OS and range of devices, and boy, has RIM come good on their promise! The much awaited BlackBerry 10 devices and their specs were announced in a worldwide launch which interestingly also changed the company itself. Calling it a rebirth, Thorston Heins announced that Research in Motion is now simply “BlackBerry”. All of their devices and services would come under a single unified brand. This new avatar brings with it a couple of brand new devices running on a new platform built from the ground up, and here’s all you need to know! The hardware on the Q10 is pretty much the same compared to the Z10, save for the smaller screen and lower resolution to accommodate that physical keyboard. That’s it on the hardware front, and from now on BlackBerry devices are supposed to have release cycles of around 12-15 months, so rest assured there aren’t many new BlackBerry phones on the horizon. At the heart of these new devices lies the BlackBerry 10 operating system. A completely new OS built from the ground up, it aims to bring together the communication features and business capabilities of the previous phones along with a more modern, usable and sleek UI with better social integration. The rule of thumb (literally!) 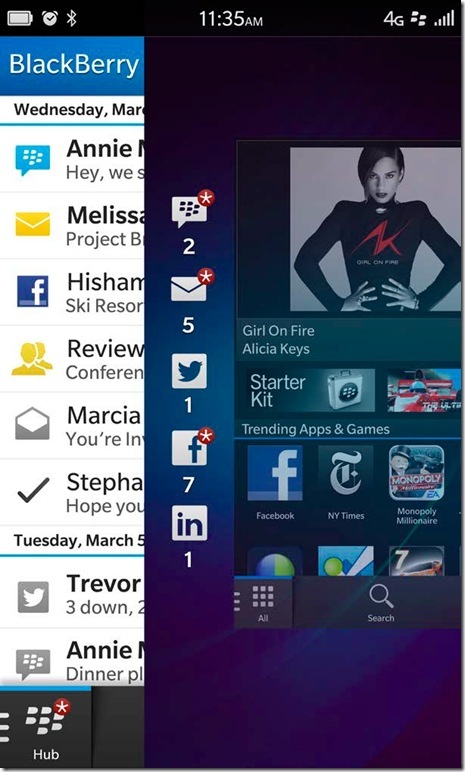 for the new BlackBerry 10 OS is swipe to do stuff. Everything is now operable with one hand, including the keyboard. 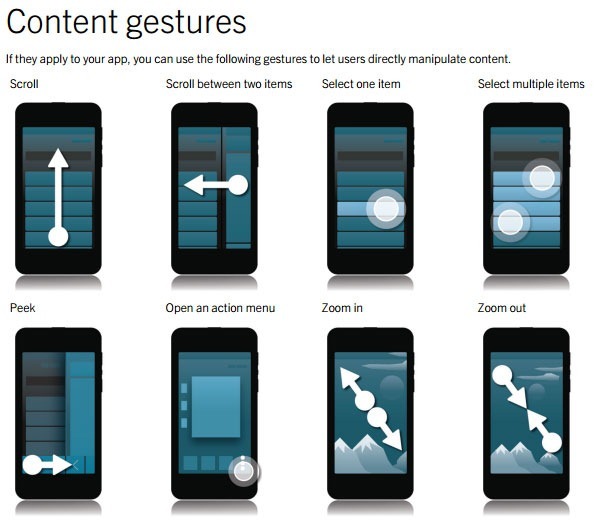 As mentioned in our BlackBerry 10 first look, there’s a lot of new features. First off, there’s BlackBerry Peek, which allows users to take a look at updates without actually unlocking the phone or pausing an ongoing video. So you can keep watching a video, swipe to the right and hold and check out updates on the BlackBerry Hub. The BlackBerry Hub is one of the most talked about new feature. It’s basically a collection of all sorts of communications in one place. That includes Facebook, SMS, LinkedIn, Emails, BlackBerry Messenger, you name it. All of the third party social networks are also integrated such that contacts appear as one name with all details, à la Windows Phone. Mails can be deleted, replied to, Facebook requests can be accepted and much more from one single hub. Multiple selections and such require two or more taps and it might take a while getting used to. One new feature that I was really excited to see was the new keyboard. It’s been called the best keyboard on any smartphone ever by the CEO, and it was good to see that this wasn’t just an empty claim. 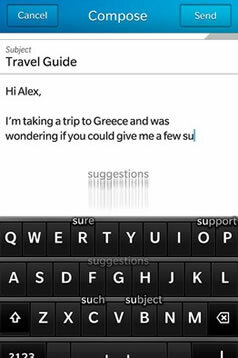 The new BlackBerry 10 keyboard features on the fly word predictions, on the fly language changes, and lets you “flick” suggested words upward to the writing area. Deleting a word can be done by swiping to the left anywhere on the screen. Basically, it’s a very one hand usage friendly keyboard and will be a boon for those who need to communicate on the go. As for the Q10, it’s got the physical keyboard that a lot of people prefer, and typing is going to be quite effortless we assume. While BlackBerry’s weren’t exactly known for their multimedia prowess, this time they’ve gone all out to appeal to all kinds of people. To begin with, the camera now comes with a best face sort of function that lets you capture that perfect shot, called “Time Shift”, then there’s a lot of new filters and editing options built in and finally there’s tap to capture photos. Focus can be shifted by tapping and dragging the reticule around, quite a change from the usual tap anywhere to focus on most phones today. There’s also a brand new feature called the “Story Maker”, which lets you choose any media and automatically creates a movie, complete with background music and titles in a few seconds. It’s a cool feature for sharing those holiday memories. BlackBerry is synonymous with business users, and apart from a completely new BlackBerry Messenger that now includes voice chat and a remote access feature called “Screen Share”, there’s upgraded enterprise solutions and apps onboard. There’s also modes of operation, which lets you isolate work apps and files from personal data and keeps both secure and encrypted. BlackBerry Remember lets you organize mails, notes, calendar events and pretty much anything under one topic so you have all the resources for at a single place. And finally the biggest concern that early adopters have, the apps. Once again unifying their content, all of BlackBerry’s new content, which includes apps, movies, games, music and TV shows will be available in a single place called BlackBerry World. Some of the biggest names have already signed up and apps are ready to use, such as Facebook, Skype, Bloomberg, New York Times, Angry Birds and much more. As of now, there are supposed to be 70,000 apps, no mean feat for a brand new OS. Looks like the paid port-a-thons really did make a difference! If you’re interested after all that, most major markets will have these devices in stores by the end of February. The lucky folks in the UK are the first to get it, and will be able to purchase them on the 31st of January. Canada will get them on February 5th and UAE on the 10th. US residents will have to wait until mid March. In Canada, the Z10 will go for 149.99$ with a 3 year contract and contract free price in the UAE is said to be AED 2599, which is around Rs. 37,700. All in all, BlackBerry 10 devices look really promising and it’s always good to see competition, because competition drives innovation. While it may not have a very big advantage over its rivals, like every OS BlackBerry 10 will find its share of adopters. Not to forget that a lot of businesses have already probably made bulk orders. For older BlackBerry users it’s not going to be any easier since it’s basically a completely new OS, but we’re sure that die hard fans will lap it up regardless. So let us know what you think about the new BlackBerry 10 devices, do they have the oomph to climb to the top of the smartphone market? That really a nice article. 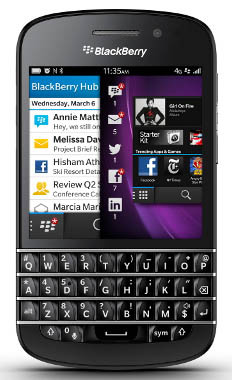 Coming to BB10 sure it has some unique features.Hope the BB10 will survive in the market. But the Butterfly is presently top in the market. That really a nice article!